Review of Affiliate Marketing! Launch a Six Figure Business with AMAZON or Clickbank Products! 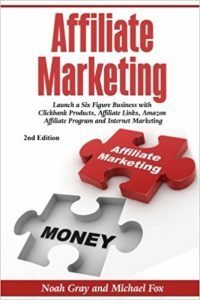 Another book for aspiring entrepreneurs is from Noah Gray & Michael Fox on Affiliate Marketing. This book will guide you to start up your own online business and will equip you with support knowledge of the Do’s and Dont’s of the online marketplace. The authors of this book did a great job in breaking down topics and algorithms that were used online. It is an advantage if you are knowledgeable to make your own website or blog or have an existing one. This book will help you enhance your computer skills and use it to a greater purpose. Recommended also for those who are in the affiliate marketing for a while – you can learn new things as well as the latest trends of online marketplace. Technology continuous to evolve, more and more methods were formulated to make online business more easy!